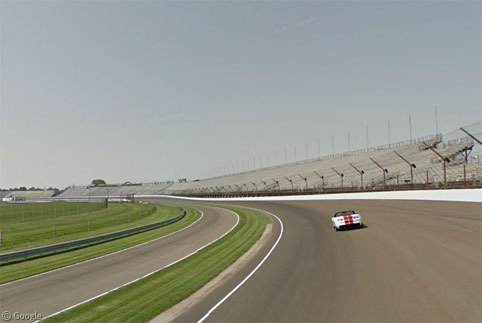 This weekend will see the 98th running of the Indianapolis 500, modestly called The Greatest Spectacle in Racing. 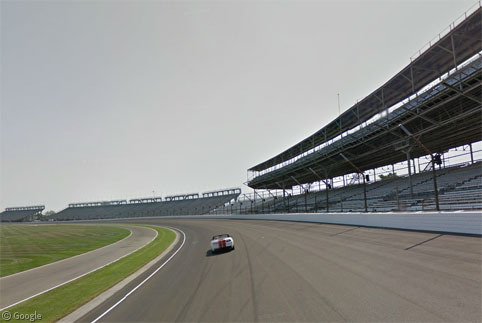 The contest takes place at the Indianapolis Motor Speedway, which was visited by the Street View car a couple of years ago. 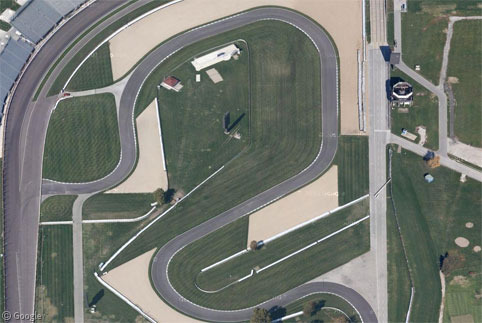 So, start your engines and join us for a tour of this celebrated race track. The race was first run in 1911 but has missed a handful of years (due to WWI and WWII), meaning that the 100th running will take place in 2016. This YouTube video has a short history of the race if you’re not aware of its legendary status. 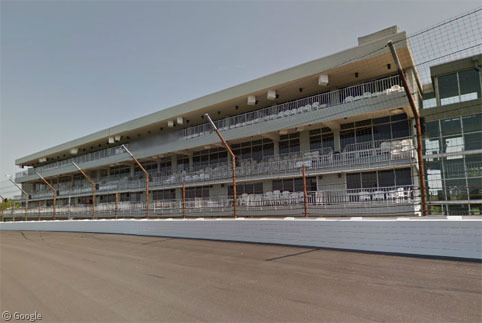 When the track opened in 1909 the original crushed stone surface quickly deteriorated, leading to several tragically fatal crashes at the first ever event. Although paved roads were still relatively rare at the time, the owners quickly looked for a better racing surface, soon settling on bricks. Over three million were needed to cover the entire 4km (2.5 mile) oval circuit, with a 1m (3′) strip still being preserved today as the start/finish line. 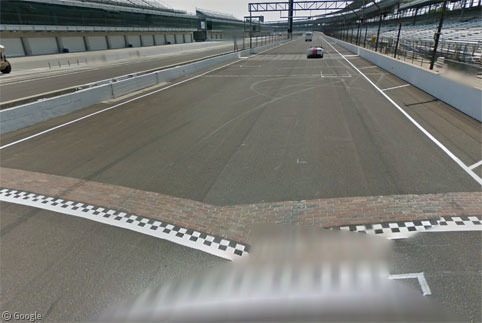 The track still retains the ‘Brickyard’ nickname from its early days. 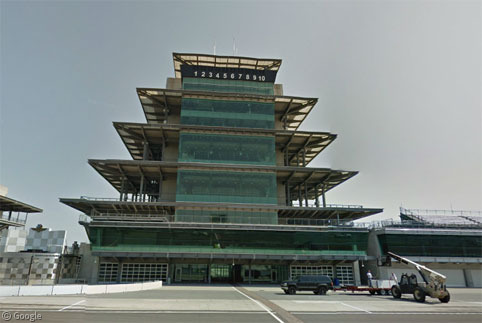 The iconic pagoda structure which straddles the line has taken several forms over the years. Initially a wooden structure to house timers and media, it is now a 10-floor high-tech control tower where races are monitored by officials. 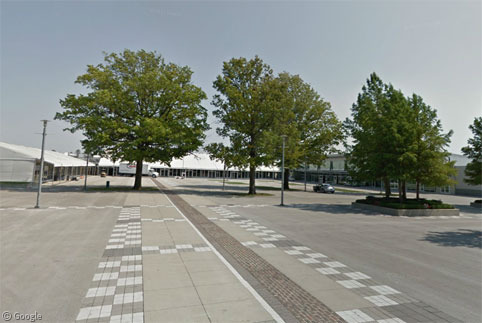 The strip of bricks continues behind the tower into the Pagoda Plaza, a hospitality area away from the track. Thirty three Indy Car drivers race 200 anti-clockwise laps of the oval, based out of pits (garages) which are located between the pagoda and the first turn. 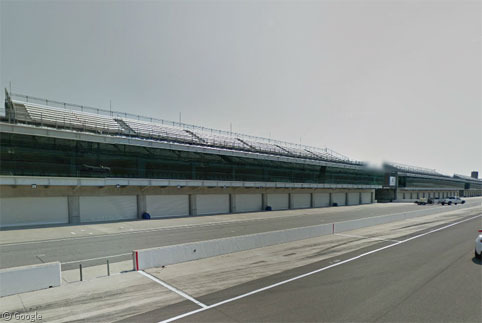 Known as ‘Gasoline Alley’, the pits are topped with terraced seats as well as a number of luxury suites holding 80 people, which can be yours for a mere $65,000 for the weekend (not including food and drink). 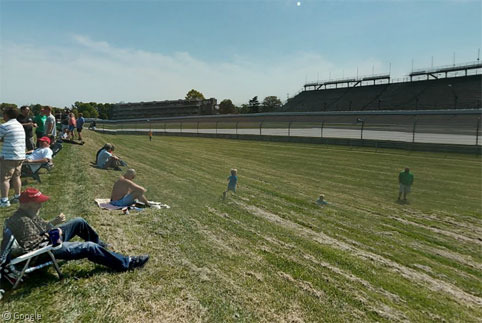 Although the official spectator capacity is a closely-guarded secret, it is believed that the permanent seating is around 235,000, with room for thousands more on grassy mounds inside the track, making it one of the largest – if not the largest – paid spectator event in the world. This year tickets range from $40 (general admission) to $186 (premium seating along the home straight and the first two turns). The winner of the race is awarded prize money in excess of $2 million, in addition to a bottle of milk – a tradition that started in 1933 when the winner requested a bottle of buttermilk following the race. Within a few years local dairy marketers saw the opportunity to promote their product and gave a bottle to every winner from then on. That’s a little different to the early years of the race – legend has it that a French driver consumed six bottles of champagne during the 1913 race, which he won by a record margin! Doubtless this feat is mentioned at the Hall of Fame Museum, found between turns 1 and 2, which is accessed via a tunnel beneath the track. It houses famous cars trophies, and displays about the history of the race and notable drivers. … as well as the first of the rather-less-luxurious grassy mounds for spectators with the cheap tickets. 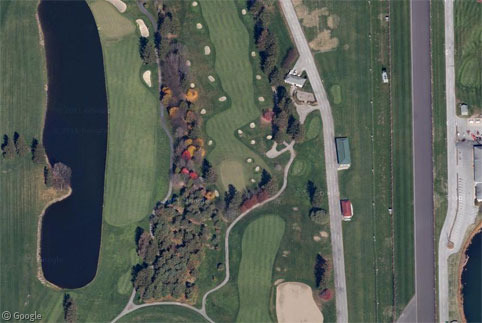 Although there are grassy mounds along the rear straight, there are no stands because the track is bordered on both sides by the Brickyard Crossing golf course – four holes of which are inside the track. Presumably the course is closed on race and practice days as a wayward shot could cause havoc on the track, while the noise of the cars would be rather distracting when trying to focus on a putt. Turns 3 and 4 are lined with more grandstands for mid-price ticket holders. 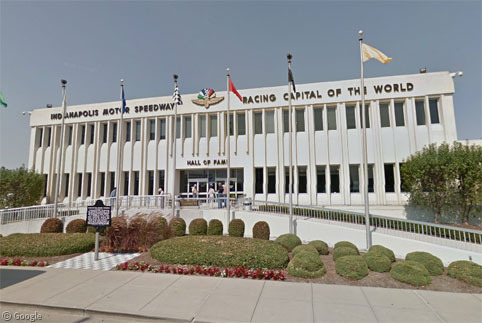 Wikipedia has an exhaustive series of articles about the speedway and the race, and the official site has all the race information you need for this weekend. As someone who grew up watching both F1 and IndyCar, it a good oval race is much like a good road race – it all comes down to the track. Part of the allure of the track at Indy is that it produces exciting car-to-car racing at very high speeds; last year’s race saw 64 separate lead changes. The far-smaller and higher-banked Iowa Speedway is also fun to watch IndyCars on. 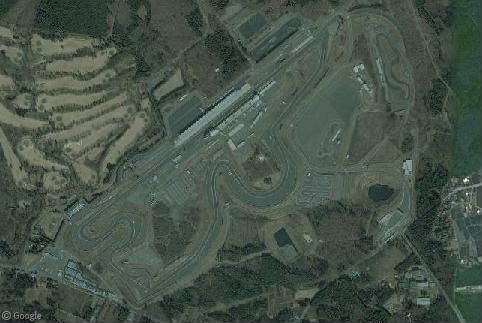 IndyCar racing in general tends to be pretty exciting on most any track; road, oval, or street (or airport, RIP). On the other hand, you have some ovals (particularly the 1990s-era ‘cookie-cutters’ owned by the same family that owns NASCAR) that manage to produce the same follow-the-leader races some people criticise F1 for (the only exciting things in these races are often the crashes – especially when it comes to NASCAR, which is pretty neutered and contrived these days, sadly). The IndyCar schedule doesn’t have a whole lot of ovals on its docket this year for that reason; open-wheel fans in North America have largely tuned out on oval races that aren’t the Indy 500, and even NASCAR fans are starting to tune out for the first time in years. Thanks for all the info Kyle – very interesting! Of course, not only is Indy this Sunday, but there’s also F1’s Monaco Grand Prix earlier in the morning, which I wrote about here a few years ago when Street View hit the principality for the first time.